Mind the Gap is a new complexly layered watercolor from the mind of illustrator Marija Tiurina (previously), which melds fictional scenes from above and below ground. The work is jam packed with both realistic and highly imaginative characters that exist in a parallel universe to North London. Cool colors denote what is happening above ground while reds and pinks towards the bottom right corner signal that the work has moved into the London Underground. The work was inspired by Tiurina’s daily commute on the Central line, which is one of the deepest and hottest lines in the city, and is known for its particularly heated rush hours during the summer. Take a peek at other rich watercolor works by Tiurina on her Instagram, Facebook, and Behance. For several years artist Kevin Peterson (previously) has created paintings that occupy the same fictionalized world. His imagined environments are occupied by children and animals— individuals band together as they navigate depleted urban environments. The works pair the innocence of its subjects against a broken and crumbling world, addressing the various journeys we each take through life. 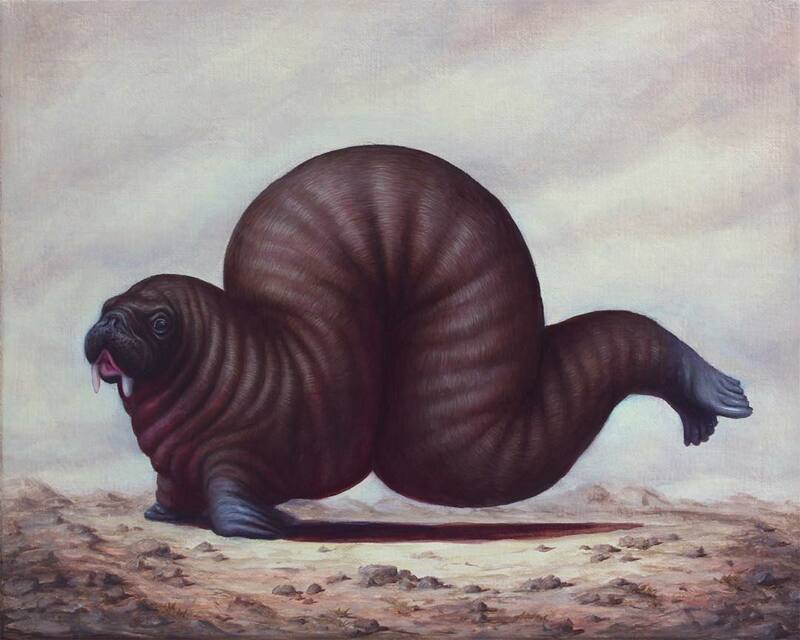 Bruno Pontiroli creates mind-bending explorations of the relationship between humans and animals, painting limber cows doing impressive handstands or an over-eager man embracing a large walrus, much to its chagrin. The artist shies away from labeling his work as Surrealist or Dadaist, instead proposing a new version of reality without categorization. Pontiroli will exhibit work with Galerie Klaus Kiefer at art KARLSRUHE from February 21 to 24, 2019 and with Fousion Gallery at Urvanity Art Madrid from February 28 to March 3, 2019. You can peek further inside Pontiroli’s bizarre world of shape-shifting humans and balancing bovines on his website and Instagram.